We know people use social media in crises. But can social media influence the decisions of emergency responders? A MITRE team conducted a simulation experiment, or SIMEX, to find out. "We're over capacity; we're going to have to branch out to other hospitals..."
"...484 ill, 86 fatalities, 96 injuries..."
It may sound ominous—but thankfully, it's not real. Under Dear's direction, the team is participating in a simulation experiment (SIMEX), conducted by MITRE's National Security Experimentation Laboratory, to determine whether citizen input via social media can influence the outcome of an emergency response. "In many ways, this SIMEX is a combination of the Emergency Broadcast System and a neighborhood watch," says Dear. People routinely use social media in emergencies. But does social media affect the actions of first responders and government officials? MITRE put together a realistic SIMEX, or simulation experiment, to test the concepts behind the Citizens' Emergency Response Portal System (CERPS). The SIMEX allowed the public to engage one-on-one with crisis personnel improving situational awareness and opening the door to influencing their decision-making process. Avoiding the "Orson Welles Effect"
The Virtual Citizen Operational Presence (VCOP), another CERPS application, provided a real-time depiction of the emotions and sentiments of the public derived from the automated analysis of student chirps. CERPS and Chirp were open source applications adapted for the SIMEX; VCOP was based on MITRE's research on "social radar," a vision for a capability that provides situational awareness of public perceptions, beliefs, and behaviors. The experiment was funded by MITRE's internal research program; the Enterprise Systems Engineering Capstone program, which supports integration and interoperability across the National Security Engineering Center's work program; and MITRE's Homeland Security Systems Engineering and Development Institute (HSSEDI) CORE program, which supports cross-cutting research that benefits all DHS components. "We already know people use social media in crisis situations, but we don't know how or whether input via social media influences the actions and decisions of emergency responders," Dear says. "The processes and procedures being explored in a SIMEX could eventually be implemented and applied, making the crisis response and event recovery more efficient and successful." Over months of planning, the SIMEX team came up with a scenario: a controversial author named Simon Pierce visits the Mason campus, and anti-Pierce groups respond with violence. Two hundred Mason students were recruited to play the role of individual members of the public, using Chirp to respond to disaster scenarios created by the SIMEX team in real time. Back at MITRE, an emergency operations center (EOC) was staffed with representatives from the university, Fairfax County, and the military, all reacting as though the virtual event was, in fact, real. Upstairs from the EOC, the MITRE team staffed a control room, or "white cell," determining each day how the scenario would unfold and monitoring the EOC's and students' responses. The team used eye-tracking software to track operators' eye movement as they scanned the feedback sent via social media. Coordinating the SIMEX involved a great deal of technical planning and integration. The operations, from planning to execution, were the responsibility of Modeling and Simulation Engineering group leader Tobin Bergen-Hill, who served as SIMEX director. Alaina McCormack, senior software systems engineer, served as the event's technical director. 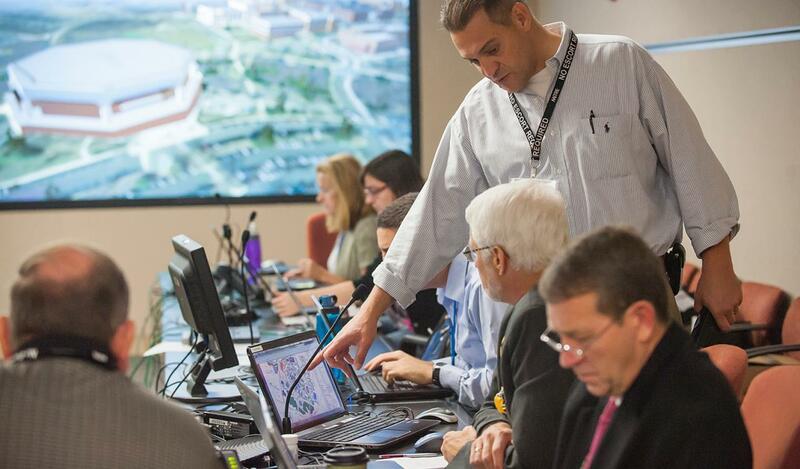 Under the daily direction of George McFadden, an information security engineer and SIMEX scenario lead, events ranging from chemical attacks to exploding vehicles to snipers firing from a rooftop took place in the simulation space. "The idea was to drive casualty numbers up high in a compressed time frame, so as to overwhelm the local resources," he says. "We wanted to involve the federal response and create a scenario that would force them to respond quickly." According to James Dear, the idea for the CERPS SIMEX grew out of a conversation with Ray Haller, MITRE senior vice president and general manager of the Center for National Security (CNS). In early 2012, Dear and Haller were discussing the National Strategic Narrative, a document written by former members of the Joint Staff on how the DoD could improve its operations. "The document recommended that the DoD engage an informed and supportive citizenry, and Ray asked how we might do a SIMEX around that concept," Dear says. From that initial idea, Dear hit on the concept of using social media to engage the public. On the SIMEX's final day, the team was asked to shut down the social media component due to a visit to the Mason campus by President Obama. "Even though we weren't expecting it, we managed the crisis in the absence of public input, and we did notice a difference," Dear says. "We noticed that before, the operators were able to use the students to get a better understanding of what was happening on the ground. They were using social media to give the students guidance and communicate directly." That direct communication with students (whose identities remained anonymous) was one of the most important outcomes of the experiment. "At first, one of our sponsors said they would never talk to the public, except via a press release," McFadden says. "But by the end of the week, they were responding to students directly. There's still an institutional bias towards responding to the public, but this gave the participants a chance to see what it would be like in a safe environment." Responders who took part in the event had positive feedback as well. "During large events in Fairfax County, we use our emergency blog, Twitter, and Facebook to gather basic information from our residents and distribute important information to the public," says Roy Shrout, deputy coordinator, Fairfax County Emergency Management. "This exercise gave us an opportunity to take social media to the next step by engaging the public on a one-to-one basis, which gave us a much clearer picture on what was going on." According to Dear, there are several possible outcomes to the experiment, including transitioning CERPS technology for commercial or government use and local or national government incorporation of CERPS into emergency management procedures. "It's important to remember that social media is a public forum for discussion—this is e-democracy at a tactical level," he says. "We are proactively communicating to the public via social media to create two-way communication between the general public and the emergency operators. The overall goal is to enhance situation awareness on all fronts."